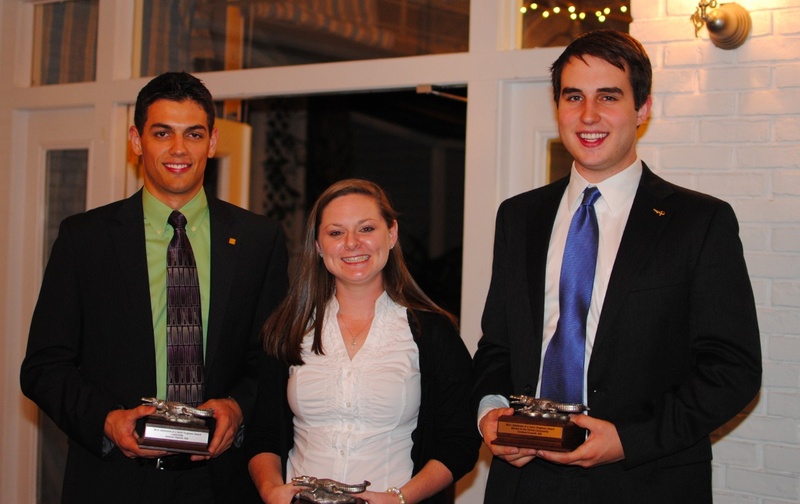 GAINESVILLE, FL: At a reception held just off campus in the Sweetwater Branch Inn on Monday, November 14, ISE Seniors Elizabeth Gillett, Cortland Russell and Andrew Vittetoe were awarded “Attributes of a Gator Engineer, Recognition Awards” from the College of Engineering. The awards had been previously announced at the New Student Convocation held in the O’Connell Center in August. Gillett, a Past President of Alpha Pi Mu that worked for GE Aviation this summer, was named the winner for Integrity. Vittetoe, Past President of the IIE Student Chapter, founder of the INFORMS student chapter and intern with Goldman Sachs this summer, was named the winner for Leadership. Russell, winner of Service to the Global Community, is extremely active with the College of Engineering Ambassadors. He hopes to use his engineering background to create societal change in developing nations. Undergraduate and graduate students from the College were named winners for each of the following attributes: Creativity, Integrity, Leadership, Professional Excellence, and Service to the Global Community.